India captain Rahul Dravid today dodged a question whether Sourav Ganguly’s name would be in the team list he would exchange with his Pakistani counterpart Inzamam-ul-Haq before the two players go out for toss in the first cricket Test starting here on Friday. Inzamam-ul-Haq and Rahul Dravid hold the Allianz Cup, ahead of the Indo-Pak cricket series, in Lahore on Monday. Prime Minister Manmohan Singh today ruled out visiting Pakistan to watch a Indo-Pak cricket match saying he has a “busy schedule” but would make a bilateral visit at an “appropriate time”. Sachin Tendulkar today said India would have to maintain their intensity right through the series as any let-up could be exploited by Pakistan who would pose a much bigger challenge this time around. 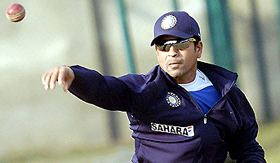 Sachin Tendulkar throws a ball during a practice session at The Qaddafi Cricket Stadium in Lahore on Tuesday. He may have been dethroned from the hot seat but Sourav Ganguly today said being stripped of captaincy will not diminish his motivation to do well for his country in the three-Test series against Pakistan. S. Upadhaya fell eight runs short of his maiden first class century while Sarabjit Singh’s unbeaten 78 powered Services to a comfortable 226 for five on the opening day of their final Ranji Trophy Elite Group B match here today. With the HP High Court today staying the registration of a parallel cricket association, led by Rajinder Zar, the Himachal team is in for a major change before the next match against Saurashtra scheduled for January 17. A spectacular strike by Bhaichung Bhutia propelled three-time winners East Bengal to a 1-0 victory over Mohammedan Sporting in the first match of the ONGC Cup National Football League here today. Indian ace Leander Paes and his Czech partner Martin Damm cruised in to the second round of the men’s doubles event with a straight set win against Augustin Calleri of Argentina and Spaniard Tommy Robredo in the ongoing Sydney International here. The decks have been cleared for the semifinal stage of the 30th All-India Liberals hockey tournament played at the Government Ripudaman College ground here today. “We haven’t thought yet about the playing eleven. At present all squad members are up for selection. We would wait till we see the wicket and then decide on the matter,” Dravid told reporters here. Asked what had he planned for the upcoming series, the Indian skipper, who was on standby duty as captain in two of the three Tests on the last visit, said the Indian batsmen needed to score big to put rival batsmen under pressure. Virender Sehwag, one of the three openers, said: “I am in good form. It’s just that I am not converting 30s and 40s into bigger scores. Pakistan is my favourite team to play against and I have done well against them. I am ready for the challenge,” said the batsman who became the first Indian ever to score a triple ton when he made 309 in Multan in 2004. Sehwag is perceived as a key player in the Indian team by rival captain Inzamam ul Haq and the other Pakistan team members given his penchant for scoring big against them. Kumble dismissed the suggestion that the cold conditions here might affect his bowling. “I have bowled in cold conditions in the past and after 15 years of international cricket, I don’t think it will be a handicap,” Kumble said. Comeback men Zaheer Khan, Wasim Jaffer and Parthiv Patel hoped they would do well if given a chance. “I’m very happy to be back in the team. It’s doing very well. I plan to contribute to the team’s success whether I’m playing or not,” said Zaheer who was ignored for the three home Tests against Sri Lanka and 12 ODIs before being named in the touring party. Jaffer, who last played for India in 2002, said: “I am happy to be part of the team. Hopefully I can play a part.” Patel also expressed his happiness to be back and said, “When I get an opportunity I will look towards making the most of it.” First choice wicketkeeper Mahendra Singh Dhoni, on his maiden visit to this country, said it’s going to be a tough series and we are all looking forward to it. Lahore: Promising youngster Faisal Iqbal got a major boost-up when Indian skipper Rahul Dravid praised his batting after the three-day tour match at the Bagh-e-Jinnah ground. Dravid spoke to the young batsman, the nephew of Pakistan batting legend Javed Miandad, after he scored 87 on the final day of the warm-up game leading to the first cricket Test at the Gaddafi Stadium starting on January 13. Prime Minister Manmohan Singh today ruled out visiting Pakistan to watch a Indo-Pak cricket match saying he has a “busy schedule” but would make a bilateral visit at an “appropriate time”. “I have not been invited”, he quipped when asked whether he would be travelling to Pakistan to witness any of the cricket matches. Asked whether he would reject if a formal invite came from Islamabad, the Prime Minister, who has accepted in principle invitation extended by Pakistan President Pervez Musharraf to visit that country when two met in New York last year, said “there is no question of rejecting it”. The record-breaking batsman was not unduly bothered by Pakistan’s strategy of preparing bouncy wickets, saying his teammates were used to playing on all kinds of wickets. He also said he had not set any specific targets for the series and would just concentrate on playing “tough and positive cricket”. “The key to the series is sticking to the basics. To win Tests you need to play well right through the match,” Tendulkar told reporters at an interactive media session at the team hotel here. “I have not set myself any specific targets for the series. I never have done so in my career. My aim is to play positive and tough cricket. There are big challenges ahead and I want to enjoy playing,” he said. He also sought to downplay his much-hyped encounter with Shoaib Akhtar, saying the home team had a quality attack not only in the ‘Rawalpindi Express’ but in three or four other bowlers as well. The world’s highest run-getter in one-dayers also said that although he had made his Test debut against Pakistan in Karachi 16 years ago, he was yet to focus his sight on the venue to which he would be returning for the third and final Test of the series. “I came here in 2004 after a 15-year-gap. We did well here (winning both Test and ODI series against Pakistan). We are all hoping to repeat the performance. I have not yet thought about playing in Karachi again where I made my Test debut 16 years ago. It’s too far ahead and at the moment I am focusing on the Test here,” Tendulkar said. India did not play a Test match in Karachi on their last visit in 2004 but are playing a Test as well as a one-dayer to round up this tour on February 19. Ganguly downplayed the fact that he was no longer the captain saying that playing for the country was the bigger motivating factor and leadership was only a bonus. “It doesn’t matter that I am not the captain on this visit. It’s the same bunch of boys who are here. Whether you are the captain or not, playing for the country is the biggest motivation and captaincy is only a bonus,” he told reporters here. The Bengal left-hander, whose controversial omission from the last Test played by India at Ahmedabad had created an unprecedented uproar, said it was important for the team to play with the same intensity they showed last time around in 2004. “I think we need to play with the same intensity like last time to win the series,” he said. Ganguly, who joined his teammates a day later on January 7 after playing in the sixth round of the Ranji Trophy league, said his only aim was to perform well. Pakistan’s middle-order batsman Asif Kamal, who has been left out of the squad for the first cricket Test against India, received a pep talk from none other than former Indian captain Sourav Ganguly who himself is facing an uncertain future. After the three-day tour match ended yesterday, Asif was seen engrossed in a 30-minute one-to-one session with Ganguly. Since the Pakistani squad for the first Test against India had just been announced, it is believed Ganguly consoled the batsman, asking him not to be disheartened. “Ganguly told him that every player faces such periods in life and tends to get frustrated and lose focus. But a good and sensible player always puts such disappointments behind him and looks ahead,” a report in local daily “The News” said quoting a person who was witness to the interaction. Ganguly also pointed out to Asim that he himself was unaware why the selectors had dropped him despite his track record. He said such things happen and since Asim had proved him at the Test level, he should simply look ahead and concentrate on scoring runs at every level. The report said Asim was also told by Ganguly to think positive and look ahead. S. Upadhaya fell eight runs short of his maiden first class century while Sarabjit Singh’s unbeaten 78 powered Services to a comfortable 226 for five on the opening day of their final Ranji Trophy Elite Group B match here today. At stumps, Sarabjit Singh and A.K. Mohanty (5) were at the crease. In the match between the two bottom placed teams, Services captain Sarabjit Singh opted to bat first and the decision almost backfired when they lost opener Madhusudan Reddy (1) in the fourth over and three overs later, next man in Jasveer Singh (1) also departed. To make matters worse, Sachin Rana struck twice in the 18th over, removing Yashpal Singh (15) and Narender Singh (22) and Services were gasping for breath at 43 for three. S. Upadhaya (92) and Sarabjit Singh (78 not out) then stemmed the rot and milked the Haryana attack to put on 173 runs for the fifth wicket before a Joginder Sharma delivery got the better of Upadhaya’s defence. The batsman faced 206 balls for his 92 which included 11 boundaries. Mr Anurag Thakur, while talking to mediapersons after the court verdict in favour of the Association led by him, said in the interest of the game major changes would be made in the team at the earliest. “The selection committee will meet and make the necessary changes in the team so that the best players get a chance to play,” he said. With the parallel bodies led by Mr Anurag Thakur and Mr Rajinder Zar locked in a legal battle, the game saw a lot of upheaval and changes in the past two months. “The politicising of the game in the recent past has been most unfortunate and now our effort will be to do all that is in interest of the game,” he remarked. Mr Thakur said he would try his level best to make the Himachal team one of the best in the country. “Let’s not play any further with the future of cricket and I assure you that we will not let politics enter the field of cricket,” he said. However, he did blame the government for interfering in the game, which was obvious from the recent happenings. “The only fault of our cricket association was that it was headed by the son of the former BJP chief minister,” he said. He said he had tried his best to bring Himachal on the national and international cricket map as was evident by the holding of Pakistan versus Board President three-day practice match at Dharamshala. Accusing the state government of playing politics, he said the Dharamshala stadium would remain top priority for the HP Cricket Association. “However, we are not averse to setting up stadium elsewhere, including Shimla and Kullu, but that would be done in a phased manner depending on the availability of funds,” he assured. The Himachal Pradesh High Court has stayed the implementation of the registration of parallel H.P. Cricket Association registered by the Registrar of Sport Association under the H.P. Sports Act 2005. This interim order was passed by a Division Bench comprising Chief Justice V.K. Gupta and Mr Justice Deepak Gupta on a petition filed by the HPCA led by Mr Anurag Thakur. Earlier, the HPCA had filed petition and challenged the new Sports Act, 2005. The high court on May 18, 2005, had passed an interim order in favour of the Anurag Thakur-led HPCA and directed the state not to take any punitive action against the HPCA. The Sikkimese icon showed flashes of his vintage self to hammer home the winner in the 77th minute. Medio Alvito D’Cunha did the spadework by feeding Shylo Malswamtluanga midway into the rival half before the latter sent a cross to the left for Bhutia. Sporting defender Wazid Ali tried to intercept but his header went the wrong way as Bhutia pounced on the ball, foxed a defender and finished off with a rasping left footer past substitute goalkeeper Gopal Das. The rest of the 90-minute match saw a very ordinary fare dished out by the two Kolkatan sides. Meanwhile, All-India Football Federation (AIFF) president Priya Ranjan Dasmunsi today announced that three National Football League matches would have to be rescheduled due to security problems. Government would be unable to provide enough police in the ground because of the CII convention here to be attended by some high profile delegates, including President A.P.J. Abdul Kalam. Asked when the rescheduled date would be announced, he said it would be announced on January 14. The AIFF Secretary, Alberto Colaco, said the AIFF had plans to bring two teams from Sudan and Ghana to play exhibition matches in India in between the Asia Cup and the Asian Games. The Indo-Czech pair, with the 6-1, 6-4 win, will now face top seeds Mike and Bob Bryan in the second round of the event. In today's engagements, Punjab Police downed EME, Jalandhar, 2-0; Corps of Signals beat CISF, New Delhi, 3-1; Punjab and Sind Bank (PSB) subdued Centre of Excellence 2-0 and SRC, Ramgarh, downed Namdhari XI 5-4. All the winners made it to the semifinals. Punjab Police now take on PSB, while Corps of Signals clash with SRC for a spot in the final, to be played on January 12. For Punjab Police, who are in the title hunt for a record ninth time, the form book held firm as they scripted a convincing 2-0 win against EME. The goal scorers were Kulbir Singh and Gabbar Singh.